Bali is a perfect place for those who are on holiday with children. Bring all your family to explore the island. You all will love the natural surroundings, and it is definitely easy to find a baby sitter or somebody to take care of your kids. Kids club are available in major hotels. Many hotels offer family room with children discounts policy which is good optional for family term. Bali villa is also a good alternative for accommodation, which is now becomes holiday trend in Bali. Mostly one villa consists of more than one bedroom that caters for family. 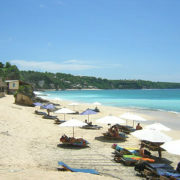 Range of attractions that are friendly for children can be also easily found in Bali. Children’s attractions in Bali vary from surf, sand and beach activities; cultural activities such as dancing, temple visits, and traditional Balinese life style experiences; adventure activities such as rafting, cycling, horse ride, dolphin/turtle tour elephant rides; and theme parks such as Bali Bird Park, WaterBom Park, Bali Butterfly Park, etc. Travelling with the family can be hassle- free and loaded with fun. There is no reason you shouldn’t bring the kids and the entire family with you. Here are a few tips you can use for an easy, stress – free travel. Get each family member’s opinion on which places to go. Kids love it when they get involved. Make a short list of the places they want to visit and get the majority’s preference. Plan simple yet fun activities for the whole family to enjoy. Help each other especially when packing. Give each one a responsibility. You can have your kids check on the first- aid kit, your husband to bring all bulky equipments and you take charge preparing the food. This way, your load can be lessened and everyone would feel the importance of each one’s contribution. Since most of the space of your car would be for people, pack only the essential things you need. If possible you can hire strollers for the kids instead of carrying one. Transfer shampoos, mouthwash and the like in small plastic containers instead of bringing the entire thing. Remember that travelling light doesn’t mean travelling incomplete. Carry all important stuff you need to bring. Since all of your family members are with you on the trip, you can opt to hire a house sitter. If not, have a neighbour look out for the house for you. Unplug all electrical appliances and be sure to secure all door and windows. Always carry with you a medicine kit for emergencies. This should include aspirins, laxative, insect repellant, bandages, ointments and alcohol. More importantly, bring enough prescription drugs if any of the family members is on medication. Bring enough to last for the entire duration of the trip. Take pictures and videos to document your trip. Take turns in using the camera, this way everyone will get a memorable shot taken. You can take the pictures and put them in a nice travel journal when you get home. This way you can enjoy the fun memories as often as you want. Remember that the entire objective of a family trip is to have fun. Follow the quick tips above and you can head your way to an enjoyable travel in Bali.